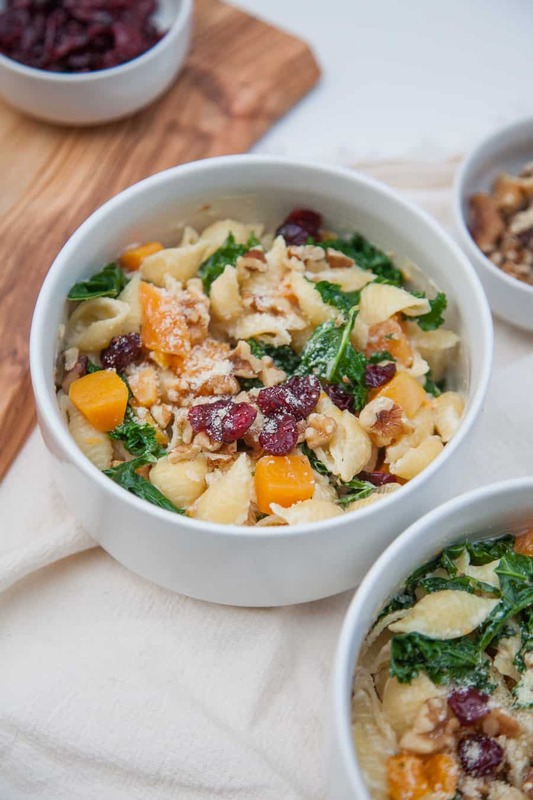 Celebrate this season by sharing this Creamy Butternut Squash Kale Pasta with friends and family! 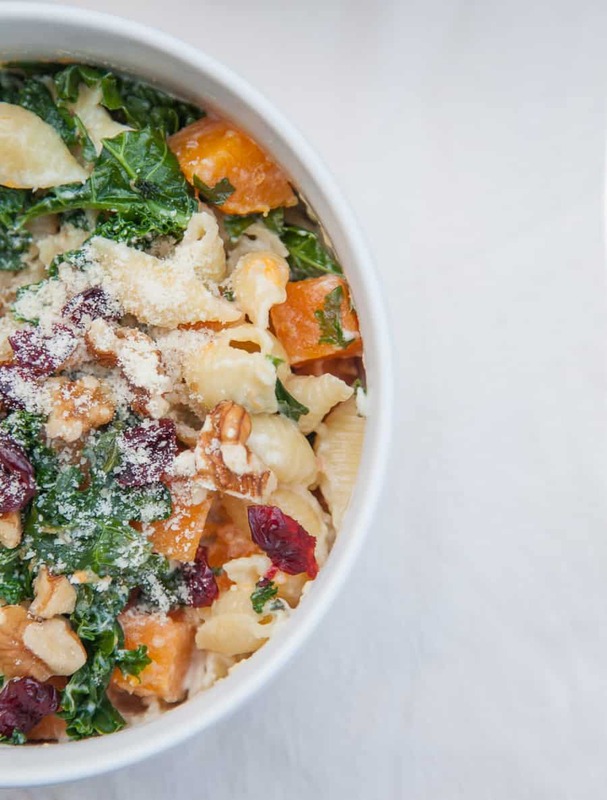 This pasta is surprisingly light but packed with winter flavors like fresh butternut squash, kale, cranberries and chopped walnuts. This is a pasta dish that is perfect to share and sure to impress! If you’ve been a reader of this blog for a while you may remember that I grew up a terribly picky eater. My grandmother still pokes fun at the fact that there was only one thing I always wanted to eat when I was growing up, macaroni and cheese. Macaroni and cheese still has a huge place in my heart, but I’ve learned to love quite a few other things. When I think of winter, I think of squash. Squash is not something that I would have eaten as a kid, a teenager or even a young adult in college- though, ironically, Greyson loves butternut squash. It’s something I’ve only grown to love in the last four years or so. 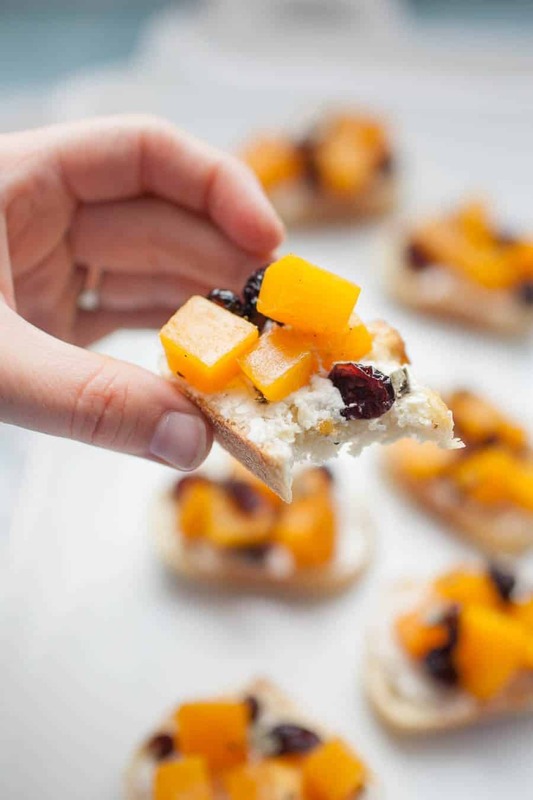 Ever since, I’ve loved trying it in different recipes like this pasta dish and these butternut squash crostinis I made a few years ago! We made this pasta recipe last week but I needed to tweak it a little bit before sharing it and I’m so glad I did! I added in more of the “toppings” like the butternut squash, cranberries, kale and chopped walnuts and it was totally needed. 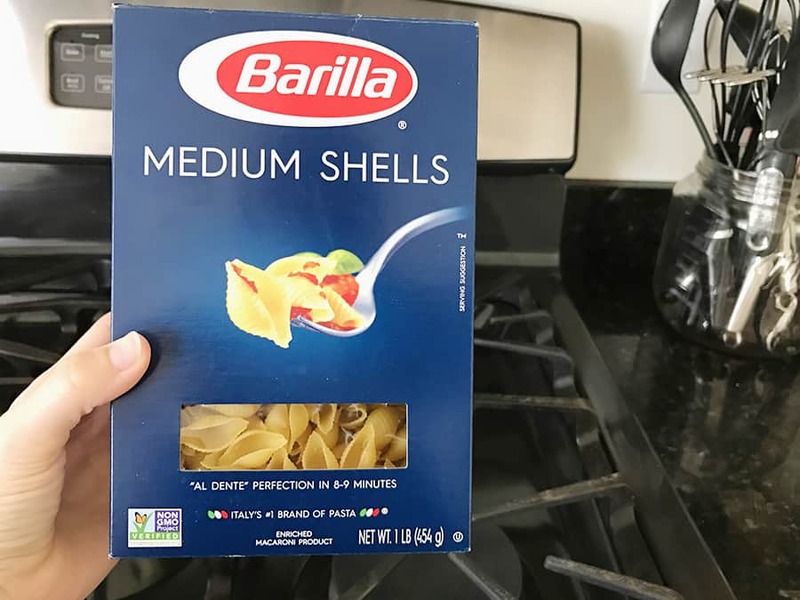 The Barilla® Classic Blue Box Medium Shells are one of my favorite pasta types lately and having a hearty amount of toppings made this pasta a huge hit with our family! This pasta dish is actually perfect for the holidays for more than just its flavors. 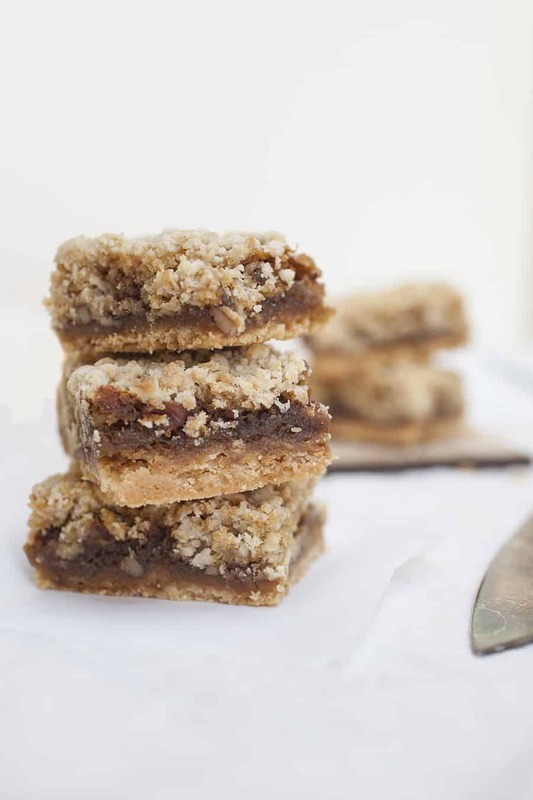 It’s great to bring to a party or work gathering because it’s vegetarian and super easy to pull together! 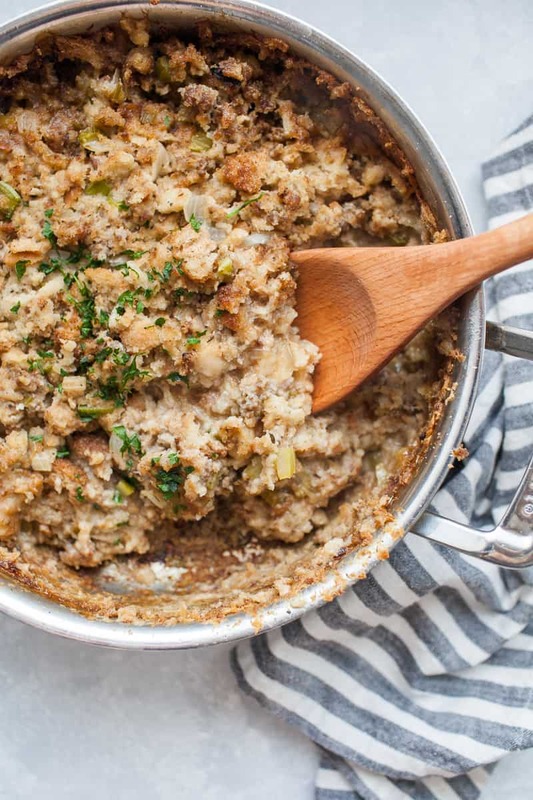 Plus, when you’re attending holiday events, it’s easy to get overloaded on less than wholesome meals so I love that this pasta dish has TWO veggies plus protein from the walnuts and creamy sauce. This dish may look complex, but it’s actually super easy to make. 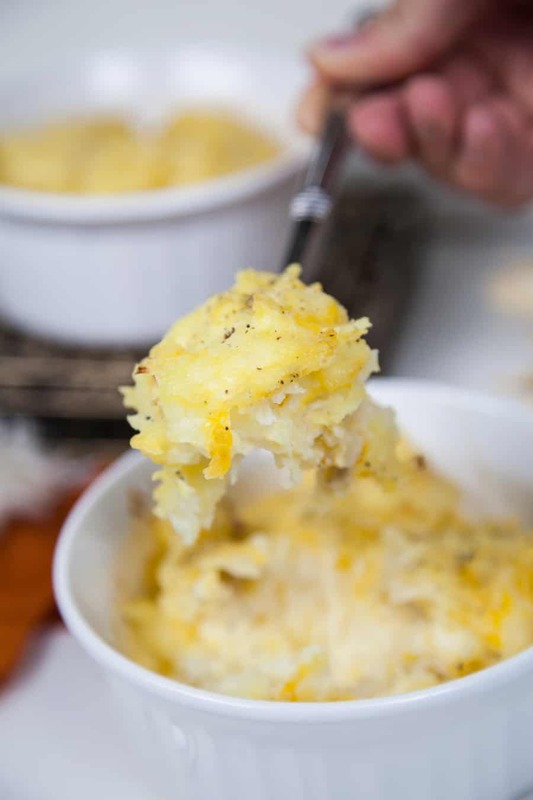 I think my favorite thing about it may be how colorful it is, especially because “winter” recipes don’t alway seem to be that bright and colorful, that tends to be reserved for summer dishes. Butternut squash is just such a beautiful squash that it livens up the entire dish. I wanted to add in a bit of a sweet complex because butternut squash is fairly sweet. Not like eating a piece of candy or anything, but compared to the kale, it’s definitely more sweet than savory. 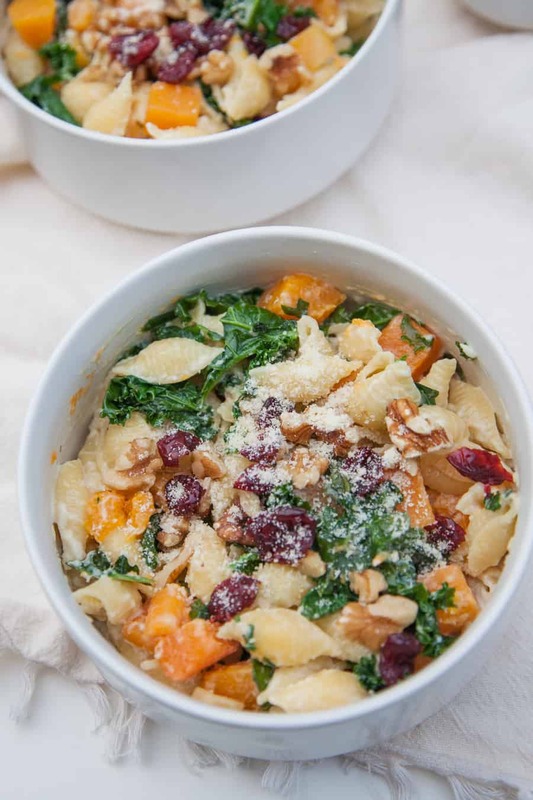 The walnuts ended up being a great compliment to the kale and the cranberries complimented the butternut squash so the entire thing was balanced well. 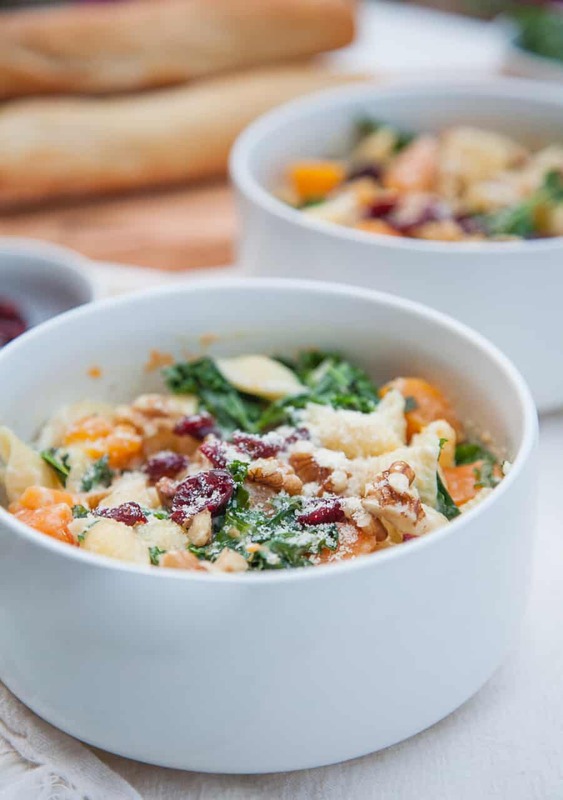 This shells pasta is surprisingly light but packed with winter flavors like fresh butternut squash, kale, cranberries and chopped walnuts. Cover pan and cook squash for 5-7 minutes, be careful not to overcook! Be careful not to overcook the squash. You can use fresh squash, cut out of the skin after the pulp is removed. You can also find prepackaged butternut squash at Target or other grocery stores. If you’re like me, you peruse the aisles of Target frequently, trying not to get distracted by their amazing selection of home decor. 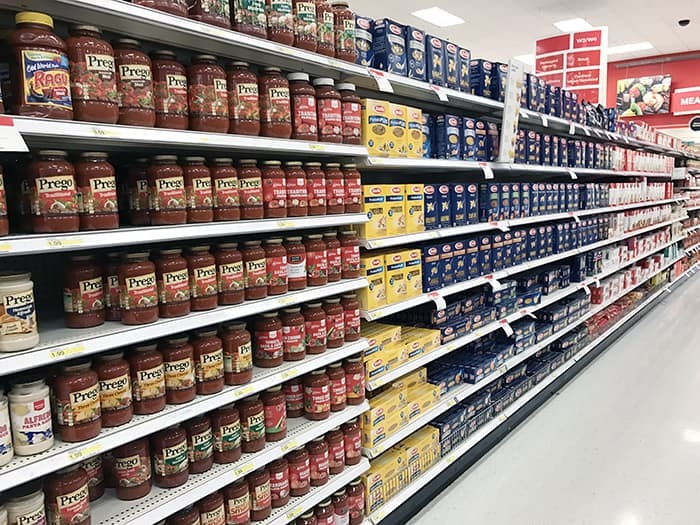 Our Target has an amazing grocery section so we love shopping there for our groceries. 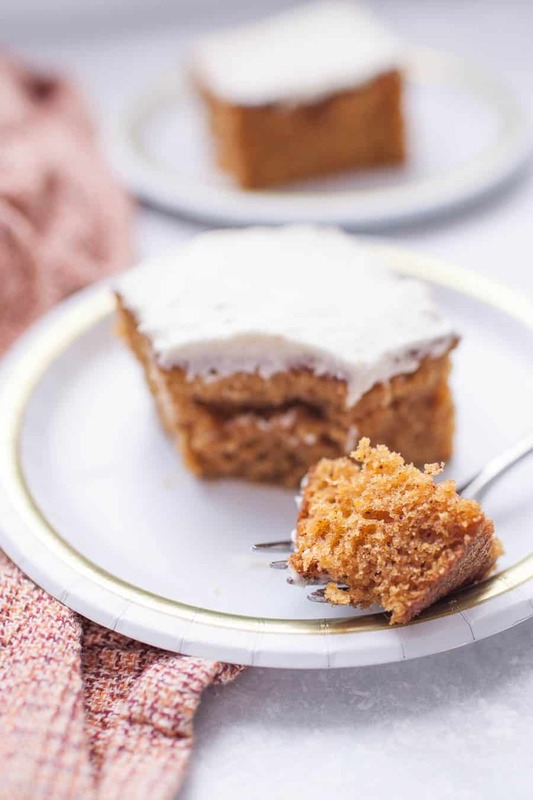 You can find everything you need for this recipe right at Target. Be sure to use this Cartwheel offer for 20% off Barilla® Pronto Pasta through 11/26! 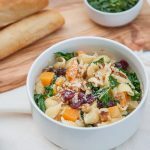 If you need an easy recipe that will impress at your holiday gatherings this year, this Creamy Butternut Squash Kale Pasta is it! 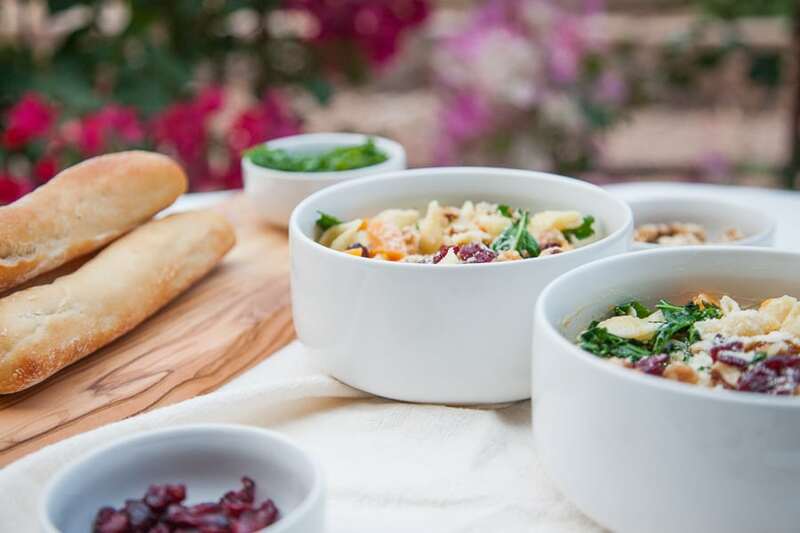 What is your favorite dish to bring to a holiday party?